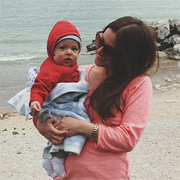 I'm excited to have Amelia of the Homebook here with our next postpartum style post. I’m a stay-at-home momma to my sweet baby Ralph, wife to my funny husband Ryan, and the three of us live in Milwaukee, Wisconsin. In our two and a half years of marriage we’ve been through two pregnancies, the stillbirth of our sweet daughter, and the joyful birth of our little Ralphie. There have been a lot of ups and downs for us, but we consider it all to be a blessing. 2. Tip number two: Organize your beauty routine, and stick to it. After I had Ralph, I realized that getting myself ready for the day no longer had any leisure to it. If I didn’t take advantage of a few quick minutes in the morning, or during naptime, I’d likely be stuck in pajamas and bed head all day long, and feeling really bad about myself to boot. Eventually, I narrowed down my beauty routine to just the essentials and figured out exactly what I needed to do to feel put together in the morning. Now I can usually get ready for the day in less than twenty minutes, including a shower! I try and do it first thing in the morning, because if I don’t make it a priority, it’ll never get done. Related: dry shampoo is your friend. 3. My third and favorite tip is this: get yourself a mom uniform. Put together an ensemble that makes you feel your prettiest, your most comfortable, your most you, and wear it to death. Don’t wear a maxi dress if it makes you feel icky. Don’t wear jeans if you can’t stand the thought of playing on the floor in tight denim that will probably give you plumber’s crack. It sounds so simple, but once you’re a mom, it’s tough to find an outfit that works in every area of your new mom life. Here’s what works for me: a top that can either be pulled up or down for easy nursing, jeans or a skirt that will (hopefully) camouflage my generous bottom half, shoes that are comfortable enough for me to walk in at a normal clip, a cute (but practical) bag, simple hair, simple makeup, and a pop of color, either on my lips or on my nails. Below is an example of an outfit I wear regularly. It works for home, the grocery store, out to lunch, or at church, and is something that makes me feel good about myself. And let’s be honest, this outfit is so comfortable it’s basically pajamas with shoes. 1. One of my favorite ways to freshen up and feel put together is to use perfume. Just a spritz on my wrists and the nape of my neck, and bam! My day is already a little bit better. And when my husband comes home from work and goes in for a hug, I don’t feel quite as bad about the giant spit up on my shoulder. This scent is clean and soapy, and isn’t too strong for baby nuzzles. 2. I know what you’re thinking—a white shirt? With a baby? But, I promise you, it works for me. A nice white tee brightens my skin, looks fresh, and matches everything in my closet. I have about a dozen of them that I wear in rotation. And when my baby lovingly splats a handful of sweet potato towards me, I just toss it in the wash with a splash of bleach, and it’s as good as new. Forever 21 and Old Navy make great white tees for less than $10, but this Madewell one has a pretty perfect fit. 3. While I love a good pair of flats, heels never fail to make me feel fancy. These sandals are definitely the most expensive pair of shoes I own, but they’re worth every penny. So cute, so comfy, and, thanks to the straps, you won’t slip out of them when you’re hustling through the grocery store. Also, they make a pretty fun toy in a pinch. Babies love buckles. 4. I wore my striped jersey maxi skirt at least twice a week when I was pregnant, and I haven’t stopped wearing it since. My current skirt is starting to appear a little threadbare, and this one looks like a good replacement. 5. Having a nice glossy set of nails always makes diaper changes a little bit more fun. It’s true. Essie’s Clambake is a cute orangey-red that’s fun for warm weather months. 6. I never found the perfect diaper bag. Everything I liked was too expensive, and everything I could afford was too…diaper bag-y. Then I finally realized a cute, roomy tote was basically the same thing. Lately I’ve been using a big canvas bag, but I have my eye on this straw one for summer. 7. (Not pictured) Nursing mama’s—looking for the perfect breast pad? Well, you can stop, because I found it for you. After lots of research, I’ve decided that these nursing pads these are the best. They’re super absorbent, super soft, and just the right size—big enough to do the job, but not so big that they peek out from under your bra. My favorite thing about them is that they’re not individually wrapped. Breast pad wrappers are annoying, unnecessary, and take up too much waste basket space. Believe me, after you have a baby, things like waste basket space become very important. You need to save that stuff for dirty dipes and chocolate bar wrappers. i'm 19 weeks right now, and i'm wearing my F21 jeans!! i love them!! super cheap and stretchy in all the right places. These are amazing tips! I have been loving this series! I haven't had kid yet, but 12 of my friends have *just* had babies and have had trouble figuring out postpartum style. I've been forwarding them this posts. I particularly love Amelia's tips today! I am 7 months post partum like you, and your first paragraph really describes how I felt too. My world was turned upside down and I had no idea who I was, or who I was supposed to be! But once I figured out that putting myself together made me feel better, I made sure to shower and make myself presentable. It made a world of difference for my self esteem. Also, pretty nails help too. :) Great tips! Here here! Those nursing pads ARE the best. I had several problems and infections before I realized it. Then I started hoarding boxes around town and buying places like Walgreens completely clean of them afraid I'd run out. Glad you figured it out too! I will second you on the Johnson & Johnson nursing pads. When I found them, I didn't know how I survived a month without them! 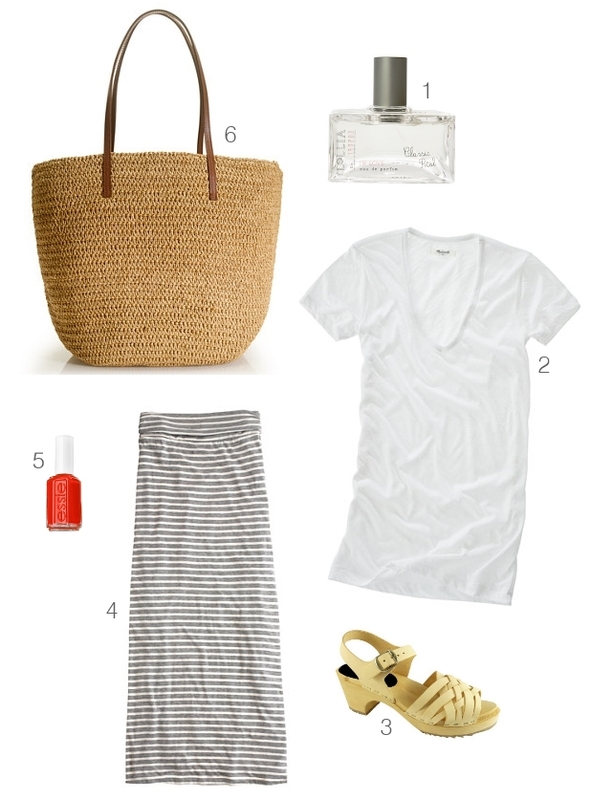 Love that J Crew maxi skirt! However, like with jeans, I'm reluctant to spend that much on a skirt that won't fit perfectly for long. Any suggestions for similar looking skirts in a lower price point?